The kind of pond that attracts the geese. I have always had mixed feelings about those geese. For so long, I ran by the pond and cursed the geese for making my would-be peaceful jog turn into a dodge-the-geese-droppings obstacle course. When Monster first came around, the geese incensed me even more as they hissed at the stroller during our routine walks. Then spring happened. The spring right after Monster was born. Spring is the time of year when the geese don’t bother me as much because they have sweet, fluffy little geese babies I can admire. 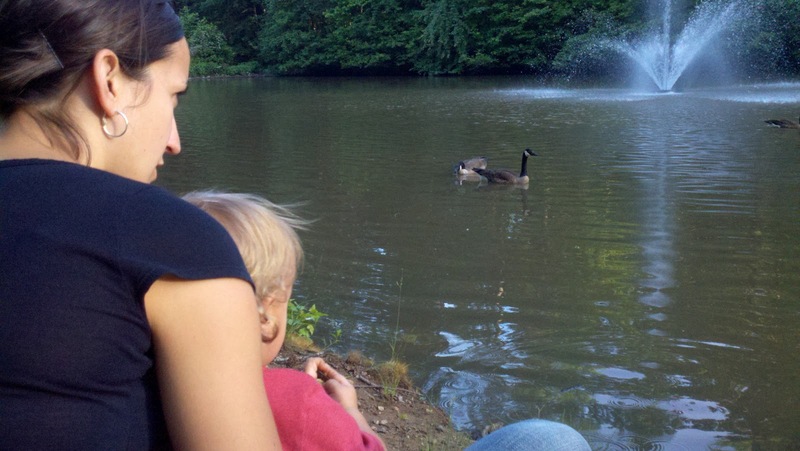 That spring, I was so excited to take Monster to the pond to see the baby geese. Sure, he was only a few months old, but surely my baby could appreciate their babies, right? Two geese families were at our pond at the time. I was thrilled to see that one family had five or six little goslings paddling furiously through the water behind mom and dad. The other geese hung in the corner of the pond. The mother was guarding her nest, tucked into the side of a tree stump, and the father was swimming nervously back and forth in front of her. “Not long now!” I remember thinking. We went back the next day, and there she sat, and there he swam. The next day – same story. A week later, still no babies. One day, Monster had drifted to sleep in his stroller, so I sat on the bench and watched the geese. I watched the new family enjoying their little ones. I watched the little ones swim this way and that, trying to figure out how to steer themselves in the right direction. But mostly, I watched the mother-to-be as she watched the new family from her nest. And I started to ache for her. I miscarried before we were blessed with our crazy little man. As I watched the momma goose guard her nest, morning after morning, night after night, I couldn’t help but think about my experience. I thought about how after the first doctor told me I had lost the baby, I scheduled an appointment to see another doctor, wanting a different answer, praying that they were wrong. I remember clinging to every ounce of hope I had that there would be life. And I remember the intense pain of learning that there wouldn’t be. And I remember feeling very alone, and very sad. I watched that momma goose cling to her nest for more than a month. Then one day, she wasn’t there. She was at the other end of the pond with three fuzzy little miracles. Life goes on. Beautiful, geese-dropping-covered life.